This coming Saturday, January 26th, there will be a really cool event happening which is being done by STL Comics. Titled, "Geeky Extravaganza," it will be another cool show put on by STL Comics, but unlike their awesome Micro Cons the focus here isn't just comics. All things geeky will be involved, including vendors who deal in pop-culture-focused jewelry, crafts, toys, gaming-stuff, anime-related things, movies, television-focused paraphernalia, and of course comic-books will still be involved too! 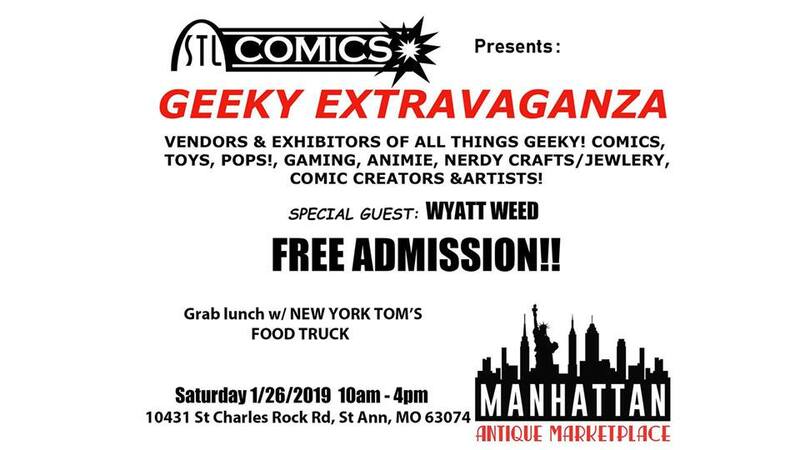 This first-ever, "Geeky Extravaganza," is taking place in the Manhattan Antique Marketplace, located at 10431 Saint Charles Rock Road, in Saint Ann, Missouri, 63074 (so right by Saint Louis). It runs from 10AM-4PM and is completely free to attend (you read that right, free)! There will be a food vendor present as well, New York Tom's Food Truck, whom I have purchased food from before at other shindigs and I can tell you he has some delicious stuff. STL Comics always put on great shows, be they big evens, micro cons, or this new, "Geeky Extravaganza," and I encourage anyone in the are who is able to attend to do so, I know I'll be there excited for some fun, food, and great deals on all kinds of geeky-goodness!